Creating a mobile application can be very time-consuming and expensive, which is why a lot of bloggers and blog sites don’t bother coming out with a mobile app of their own. 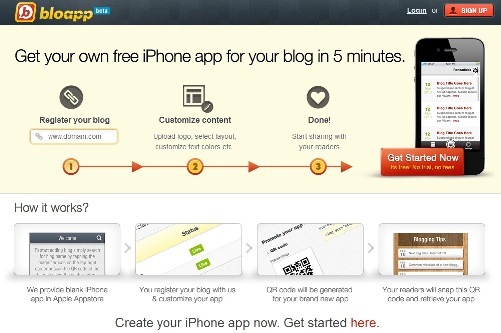 Not any more – Bloapp (www.bloapp.com) is a free web tool that helps converts blogs into a native iPhone app in less than five minutes. And the best part? It’s free to use. We all know that creating an iPhone app can be a cumbersome process that can take some time, from signing up (and paying) Apple’s developer program to waiting for up to two weeks for Apple to approve a submitted app. With Bloapp, you cut through all that headache. And the app’s available immediately. Bloapp is the brainchild of Nicky Wong, the founder and director of Kuala Lumpur, Malaysia-based Infindo Technology (www.infindo.com). Wong, a serial entrepreneur, also founded Linknet Solutions in 1999 and was responsible for developing Brunei’s first and largest online shopping website, www.qqestore.com. In 2009, Infindo expanded its business and officially set up its new office in Suzhou, China, and the company plans to expand to Silicon Valley and Singapore by the 3rd and 4th quarter of 2011. “Every blogger wants to have their own iPhone app for their blog,” says Wong. “But creating one is not an easy feat for many bloggers.” Wong adds that if the bloggers are currently making money with their blog, Bloapp gives them the opportunity to make money from a new source; mainly from smartphone users who are used to consuming the net via apps since it supports custom ads and Google AdSense for Feed. The company says Bloapp has gotten apositive response from the blogosphere since launching in early June. It is currently Currently working on the Android version, as well as preparing for a major update for the platform that will include support for WordPress.com blogs, retrieving comments for the posts, exciting new set of layouts and more.